Tomorrow (Thursday) evening in San Francisco, non-profit arts organization Gray Area Foundation for the Arts – GAFFTA for short – is hosting Galvanize: a concert, dinner and art auction to raise funds for its many endeavors. 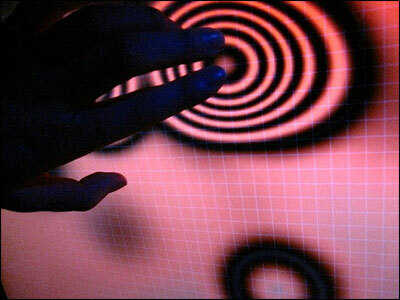 GAFFTA is a Bay Area organization devoted to hacking, creative coding, and interactive art. The organization carries out its mission through education, art curation and research. GAFFTA offers a host of classes with an emphasis in audio, visuals, web and physical interaction. Each of these concentrations is explored thoroughly. For example, the physical interaction classes highlight topics such as “various forms of 3D art, prototyping, multitouch interfaces, electronics, conductive fabrics and physical computing.” The current course catalogue offers classes on augmented reality, Arduino, visualizing and mapping data, and more. In addition to its focus on education, GAFFTA also champions new-media artists worldwide. Recently, GAFFTA curated Future/Canvas², and exhibit on the emerging medium of iPad art. 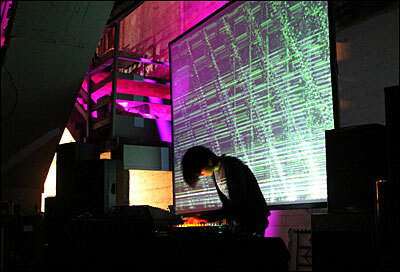 Previously, GAFFTA presented exhibits exploring urban futures and sound, data and mechanics. Artists whose works have appeared at GAFFTA include Robert Hodgin, Nicole Aptekar, Aaron Koblin and Zimoun. Additionally, GAFFTA partnered with art group Ardent Heavy Industries to produce Syzygryd– a collaborative electronic musical instrument / interactive art installation with a 2.5 ton sculptural visualizer made of metal, fire, and a kilowatt of RGB LEDs. GAFFTA’s research department exists to explore “the increasingly gray areas between art, technology, and society.” GAFFTA regularly hosts hackathons, offers collaborative research residencies, and has several large-scale initiatives and projects going on right now. And they even find time to host the occasional Cinema Speakeasy in their beautiful space below the historic Warfield building in mid-Market San Francisco. Last week, month, there was an Evil Dead double-feature with zombie dress-up! All these things cost money. And that’s why GAFFTA is throwing an epic bash in order to raise money for the new year. 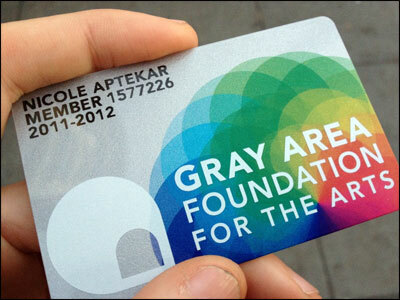 For $60, guests to the event become members of GAFFTA. This includes the snazzy membership card designed by artist Nicole Aptekar and gains entrants a 10% discount on workshops and ticketed special events in the future. Performing at the event wil be artists ELEW, Electric Method and Garibaldi. See more at the event page for GAFFTA Galvanize. Membership card designed by Nicole.